A grow facility in Desert Springs, Calif., owned by Canndescent is currently testing using a robot to patrol its outdoor crop. Todd Kleperis, Chief Executive Officer of Hardcar Security, which provides security services to the marijuana industry, said that using a robot in the evening to patrol a company’s inventory of marijuana plants saves money and is more effective. “At night guards sleep, they play video games and spend time on social media. It’s fraught with human error,” he said. Kleperis also pointed out that it’s safer for human security guards to use robots. “If you’ve ever been shot at, it’s very scary,” he said. “These robots can take a gunshot better than a human.” They don’t shoot back at intruders, though Kleperis said that they are considering adding a pepper spray function. 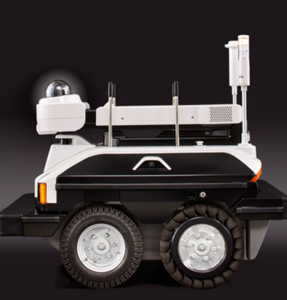 The mission of the robot is to detect whether anything is wrong, and alert human monitors. Next, an automated trimming machine is used to process the harvested plant and then finished up with a hand trimmer. In the following step, an employee puts the product in the package and once it goes into the package, the machine does the rest. It’s sealed, bar coded, counted and then dropped into a box. A laborer puts the lid on the box and then it goes out to the store. “It’s been a game changer,” Lade said. Smokey Point currently packages 30,000-50,000 units a month and at that rate, he must automate some tasks. His new facility will be ten times the size of his current place and he will need to package almost a million units a month – just for Washington state. Lade has plans to become the biggest producer in the state and wants to expand to other states and maybe even other countries.